Snowpack Summary for Tuesday, January 15, 2019 3:54 PM Avalanche hazard increasing with significant snow and wind this week. Overall: With one to two inches of snow water equivalent forecasted through today and tonight, natural avalanches and human triggered avalanches will become likely. Your problems will be wind slabs, persistent slabs and storm slabs. The existing snowpack contains weak faceted crystals with denser snow above. These faceted layers are reactive, showing a tenancy to propagate collapses within the snowpack. The video below demonstrates the collapsing persistent slab problem that we are dealing with on northwest, north and northeast aspects. .
That video is from a 39° north aspect at 10,400' in Beard Canyon. Similar slopes would include northerly slopes of Core Ridge. Human triggered avalanches will become likely with significant accumulations, and may become very likely. Whumpfing and cracking below treeline where observed last week. Small, localized skier triggered wind slab releases near treeline have been observed over the last 7 days. Near and Above Treeline:Localized wind slabs are sensitive and fracturing under the weight of a skier/boarder. 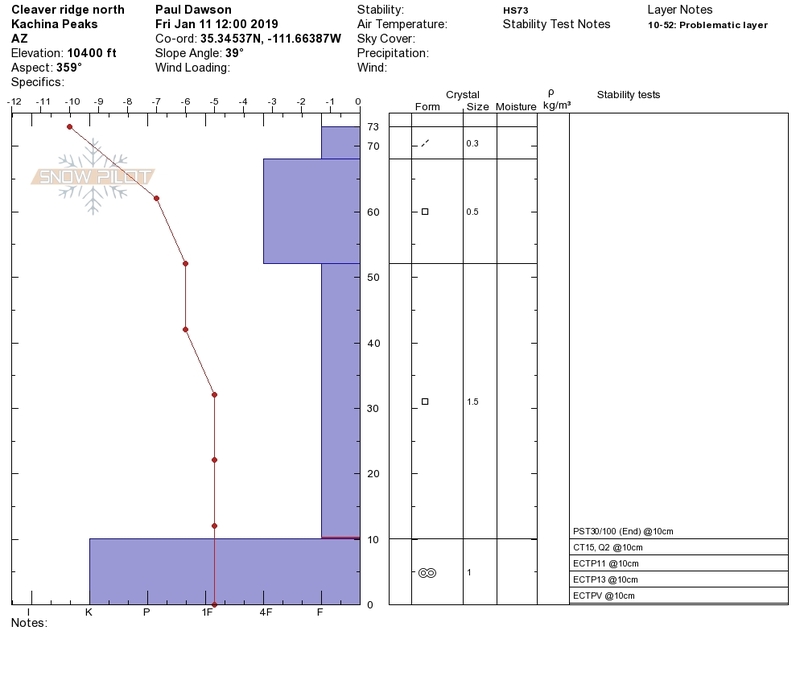 Increased fracture propagation and energy has been observed in stability testing below and near treeline, indicating an increasing trend in the probability that new precipitation forecast this week will significantly increase the avalanche hazard. Additional precipitation warrants an assessment of wind loading in terms of aspect and elevation. Above treeline slopes are much more susceptible to wind slab formation. Remember most slab avalanches occur during a storm or within 48 hours of accumulation. Below Treeline:Cracking and whumpfing have been observed below treeline, an indicator of a reactive weak layer within the snowpack. The near surface facets from the cold spell in late December are collapsing under the weight of the new snow and skier traffic. Carefully assess run out zones and terrain traps. Before the current storm, our lower elevation snowpack depth tapered to 15-20" below 10,000'. Winds are picking up with the current storm. Keep an eye on the ASBTP weather station. Readings between 10 and 30 mph indicate the potential for snow transport and formation of wind slabs. Look for various links under the weather menu above. Weak faceted snow-layers under old wind/storm slabs exist at elevations above 10,000'. Column tests have revealed this problem to exist on northerly, northeasterly and northwesterly aspects. New snow and wind slabs may overload these persistent weak layers. January 11th pit showing propagation potential of persistent slabs. Backcountry permits are required for travel in the Kachina Peaks Wilderness and available at local USFS locations, as well as, at the Agassiz Lodge on Saturday and Sunday 8:30 -11:30 a.m. The storm that hit last Saturday night, January 12th, dropped 6-7 inches of new snow at 10,800 feet and above on the San Francisco Peaks. Since then a major warm storm has impacted the region bring 1 to 2 inches of snow water equivalent and 11 to 16 inches of moist high density snow at elevations above 7,500 feet. Moderate winds out of the south and southwest have accompanied the precipitation. On Friday morning, January 15th, the Inner Basin SNOTEL site (Snowslide) reported a snow depth of 32 inches (81 cm) with about about 0.8 inches of new SWE added in the last 12 hours at 9,730 feet. Arizona Snowbowl reported a settled base of 44 inches (112 cm) at 10,800 feet, 12 inches of which have fallen in the last 24 hours. So far this winter, 98 inches (249 cm) of snow have fallen at the mid-mountain study site. Since January 4th, SNOTEL temperatures have ranged between 19°F on January 8th, and 44°F on January 4th and 9th. For the same period, the AZ Snowbowl Top Patrol Station (ASBTP 11,555 feet) temperatures ranged between 12°F on January 6th, and 41°F on January 4th.